CINCINNATI -- The team behind the restaurant Senate is working to preserve a 1920s Over-the-Rhine building, but they said saving the building means tearing down an iconic mural. The building at 1536 Race Street, on the corner of Liberty Street, opened as an auto shop, and was last used decades ago as a laundromat. On the side, a mid-1990s mural is really an ad for Ollie's Trolley a block away. But the mural is personal, for some like Cam Hardy, who was painted on it along with TV's Steve Urkel and others by local artist William Rankins Jr.
"This mural reflects this community and what it used to be, and what it is today," Hardy said. "And I think a lot of people don't want to see it go." Dan Wright just closed on the building. He's the guy behind popular Vine Street restaurants Senate, Abigail Street and Pontiac. He has plans to develop the building into something new. But the building has some issues, and Wright said the brick under the mural needs to be repaired in order for the building to be preserved. "We love the mural, I'd love to keep the mural," he said. "There are obviously issues with the mural ... We'll do our best to save certain aspects of it." Wright is planning to showcase some of Rankins' work inside the future bar/restaurant. And he wants to have a new mural painted on a different part of the building. Getting approval for the plan took two years, according to Wright. The plans call for a single-story addition and two outdoor patios, according to Historic Conservation Board records. Wright said the new restaurant will be different than what he's done before, so no hot dogs, BBQ or tapas. But he said he wouldn't reveal what it will be, yet. "I don't necessarily want it be what we have on Vine Street," Wright said. "I want it to be something a little further off, a little bit more laid back and a place that has a fun vibe." 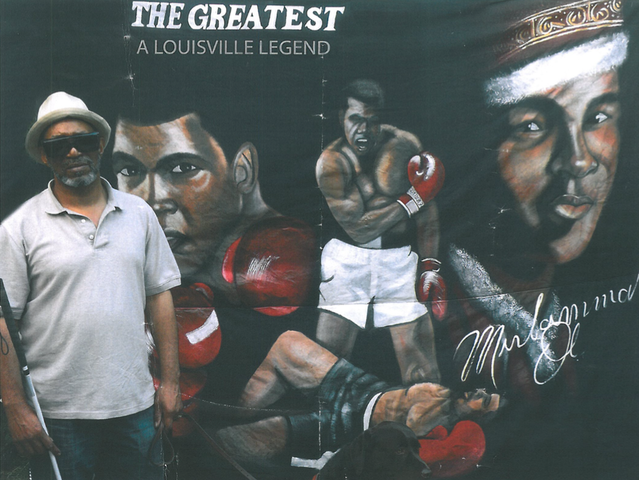 William Rankins Jr. with another mural he painted. Rankins' work used to appear all over town, but much of it has since been painted over. He doesn't paint anymore, since he was blinded in a fight with would-be robbers. He said he hopes parts of the mural can be saved. One of the boys depicted is his youngest son. Hardy hopes his 6-year-old self will also remain at the new restaurant. "You know, trying to save anything is going to be difficult, but I think it's worth a shot," he said.